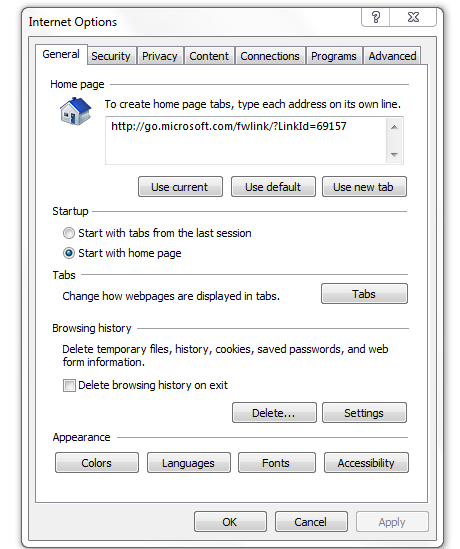 The Windows Internet Explorer Security tab is used to set and change options that can help protect your computer from potentially harmful or malicious online content. How do I find the Internet Explorer Security settings? Swipe in from the right edge of the screen (if you're using a mouse, point to the upper-right corner of the screen and move the mouse pointer down), and then tap or click Search. Enter Internet options in the search box, and then tap or click Settings. In the search results, tap or click Internet Options. What are the security zones? The following table describes the four Internet Explorer security zones. 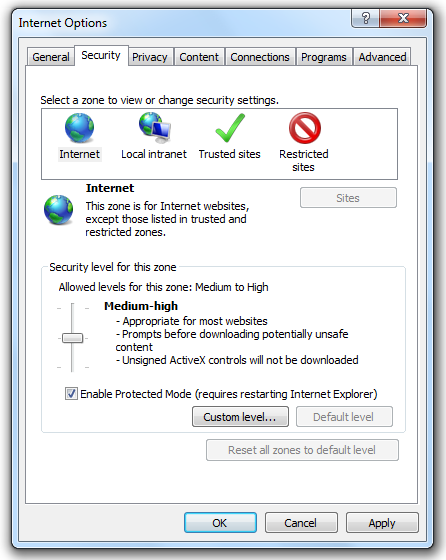 All websites are assigned to this zone by default. The only websites this security setting isn't used for are those in the Local intranet, Trusted, or Restricted site zones. The security level for this zone is set to Medium High, but you can change it to either Medium or High. Websites and other resources that are on your organization's network are assigned to this zone. The security level for this zone is set to Medium, but you can change it to any level. You can assign websites that you trust to this zone. The security level for this zone is set to Medium, but you can change it to any level. Websites that might damage files and your PC should be assigned to this zone. Adding sites to the Restricted zone doesn't block them, but it prevents them from using scripting or any active content (interactive or animated content on websites). The security level for Restricted sites is set to High and can't be changed. In addition to the default security levels, you can also customize individual security settings by clicking the Custom level button. You can help control the level of security used on a website by assigning it to a specific security zone. For example, if you have a list of sites that you visit regularly and completely trust, add those sites to the Trusted zone. Open Internet options from the tools menu item. In pop up window select the security tab. Select the 'Internet' from the zone list. Set the security level 'Medium-high' from 'High'. Click on 'Apply' and then 'Save' buttons.